The feeling that many times art needs a slower and more selective approach, the pleasure of discovering the stories behind the works or the desire to handle and combine the pieces exhibited in the museum – all of these are symptoms that distinguish exceptional visitors, or in other words Unique Visitors. This refers to an app, which also exists in a web version, in which the public itself provides hints for getting the most out of the visit to a museum, creating and suggesting personal tours of the galleries. 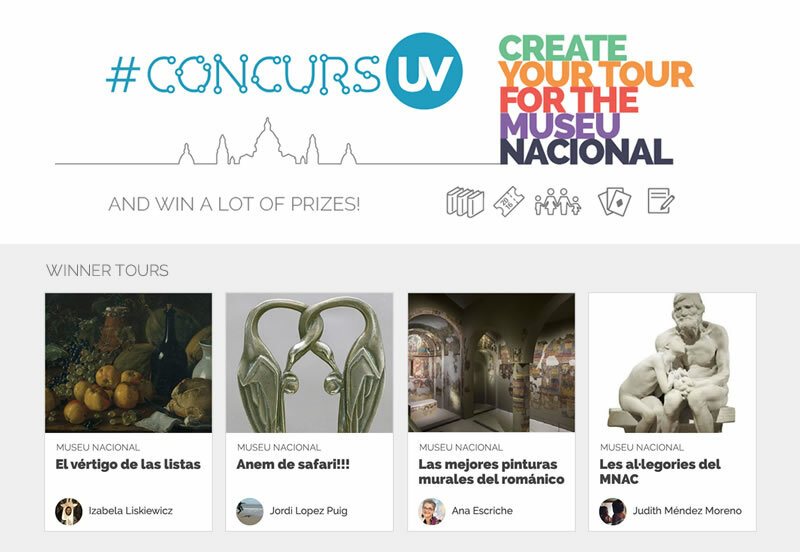 Creating my own tours with the app Unique Visitors for me is ideal, above all for the large collections, as is the case of the Museu Nacional. They have the great advantage of having a good representation from various periods and styles within European art, starting with Romanesque art and until the 20th century. But even for a museum enthusiast like me, the quantity and diversity of the examples can turn out to be a bit intimidating. Proposing a personal tour according to some reason, period or simply as a hobby, is a great help in moments of disorientation. The app allows priorities to be established within a more global vision of art. It isn’t necessary either to offer complete interpretations about each piece-stop of the tour, sometimes it’s only necessary to formulate an intriguing question to awaken the curiosity. When I say “global vision” I am referring to the broad chronological discourse, which happens in the majority of museums in search of a little order. Here the personal tours really come to life: jumping between works of specific art, you don’t have to be tied by the chronology, but you don’t stop seeing it either. You can see through the corner of your eye the disappearance of the gold on the altarpieces while strolling through the rooms of Renaissance art en route to the next point of the tour. Nor do you miss the appearance of photography, even though the tour you are following doesn’t include any snapshots. The satisfaction of having seen an exhibition concentrated in a barely conventional motif or an attractive problem is something that makes you feel that the museum has its own life and voice in a debate. The possibility of creating a virtual visit by means of this app is even more stimulating. As a visitor, or also sometimes as a guide, the moments are always appreciated in which you are able to follow the evolution of a certain concept, bring with it changes in the society or simply the chance to enjoy an interesting story. I decided on my series about the lists. Why, because, we can ask, is there anything more appropriate than a list when trying to get close to the collection of a museum? The works of art are organized by catalogues and inventories and the way of exhibiting them is a discourse in itself. Of course, the idea that the list, a method that tends to go unnoticed, can be a provider of complex concepts is inspired by the work of the recently deceased Umberto Eco, my personal teacher. He elaborated on this extensively in the book The infinity of lists that not only dealt with lists in their own sense, that is to say, with numbers and words, but also visual and even verbal lists. It turns out that different sorts of lists found in the arts can function, for example, as demonstrations of power of the contractor or the technical affinity of the artist. The author also argues that the phenomenon of manic accumulation and cataloguing within the artistic production can even aspire to be a folk remedy for the fear of fading away. His reflections had possibilities to be visualised in the form of exhibitions and a series of events about the nature of the lists – the cycle organised in the Musée du Louvre, whose collections Umberto Eco mainly researched. I used them to create my own vision of the topic, basing it on the collection of the Museu Nacional. In the same way as in the case of the examples given by Eco, some of the lists found are quite evident (for example the series of allegories) and, to perceive others, a certain imagination is necessary (interiors and still life). Lists can be identified such as “practices”, similar to inventories or material of reference, and others which are more “poetic”, maybe less explicit. Both creating visits and following original visions of other fans is a moving and gratifying experience. The collection becomes a block of marble which can be shaped according to individual preferences. One can get hooked on a game and at the same time access the art collection in an active way, practically as a virtual curator. It turns out that an art collection is not in any way an established discourse, complete and immobile. Thanks to the thematic tour the visitors gain a personal connection because the pieces they have just seen now really signify something unique. And that is all you could possibly ask for in an encounter with art. The contest has finished but Unique Visitors continues open. 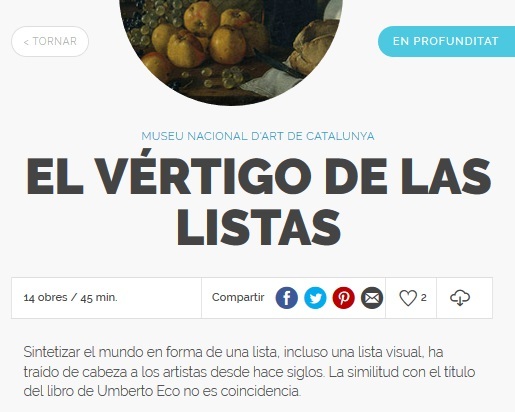 We invite you to browse it and to continue creating and sharing personal tours of the museum.